Learning NEXT: Personalized Learning: More than Student Choice? Before we can assess how well it is working and what changes, if any, need to be made, we have to know what it is. 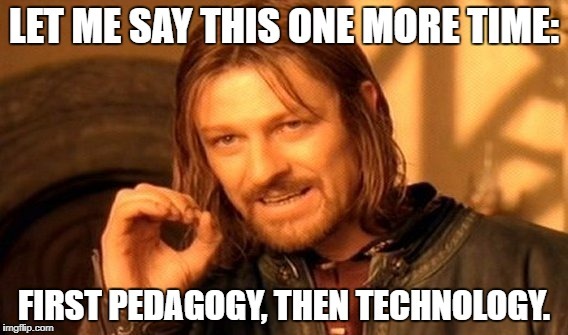 In this case, the “it” is personalized learning and personalized learning has caused educator quite a bit of agita over the years. Teachers are often asking about different reading levels or lexile levels. As Soloway notes, they want different kinds of texts for different reading abilities. Teachers seem to conflate differentiation with personalization but that may also be because personalization seems too daunting. So rather than ask what personalized learning is, perhaps the better question is “What is personalized learning supposed to be?”, or, even better, “What could personalized learning be for students and their learning?”. She has a point. Let’s look at who is investing millions of dollars into personalized learning: Bill Gates and Mark Zuckerberg. Why? Well, because they can, of course. The more suspicious of us would see marketing opportunities behind the alleged philanthropy. On the other hand, we know that online organizations want access to a lot of our information and they already gather beaucoup amounts of information through every transaction and every click online. Why? In theory so they personalize the ads we’re shown. And they do. It’s eerie, and a trifle annoying. (“Stop showing me ads for stuff I’ve already bought!” I tend to shout at my laptop, when I actually pay attention to the ads, which I rarely do.) Anyway, we can see the direction in which personalization is heading and has been heading, since back in the day when Burger King first started telling us in 1974 that we could have it our way. Cavanaugh reported that Andrew Calkins, then deputy director of the Next Generation Learning Challenges, asserted that “[t]rue personalized learning calls for a ‘rethinking and redesign’ of schools, which could require them to overhaul classroom structures and schedules, curricula, and the instructional approaches of teachers.” We all know the on-going argument that teachers’ roles much change so they are “more like those of coaches or facilitators than ‘content providers.’” We also know the practical complexities of that model, especially for younger grades. What we do know is that software is only one component of providing students with a possible pathway for personalized learning. But there is more to consider. We also know that teachers and administrators still struggle to understand what personalized learning is or can be. Too many think it requires individualized lesson plans or requires 1:1 access for students. Kenya Ransey observes that ‘[l]earning is the primary focus, and technology can be along for the ride—or not. What does it look like when technology is not at the center of a personalized learning experience?” She also asserts that “it’s critical that we realize that once we all consolidate around a standardized definition, it will no longer be personal.” I’m not sure I agree with that, but I’m not yet sure why. There are certainly plenty of educators who are not fans of personalized learning. Most of that resistance seems to be based on a lack of understanding of what it is and can be; that is, a lack of a concrete definition and clarity of expected outcomes. However, plenty of educators echo Audrey Watters’ concern that it’s simply an opportunity for large organizations to gather information about users for their own capitalistic purposes. Well, there is that and, let’s face it, every edtech organization wants to gather data on students for a range of reasons. One of Howton’s most important lessons was to give her students choice: “Class often starts with a mini-lesson, which then flows into students making choices about what they need to do next to meet specific learning targets aligned to the standards. 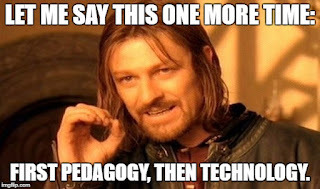 What is interesting to me is how often blended learning is mentioned in connection with personalized learning and how occasionally there is reference to competency-based learning in conjunction with personalized learning. We have a lot of trends in education and that causes much of the confusion. 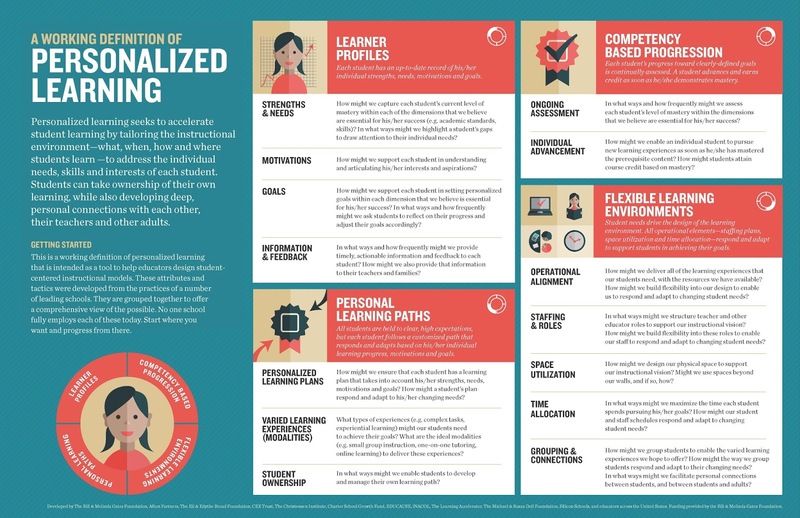 Can you implement personalized learning without blended learning? Is competency-based learning an option in personalized learning? Should we be implementing competency-based learning instead of personalized learning? But wait. This is about personalized learning and trying to figure out what that is and what it means. I don’t mean to oversimplify but I think Robyn Howton found an important key: student choice. Every teacher has objectives or learning outcomes for every lesson. The question to be asked is whether or not students have to demonstrate their learning in the same exact way and if they have to follow the same exact path to get there? If not, students have choice. I think another challenge is that teachers think personalized learning, like blended learning, needs to be something they do every day for every lesson. That doesn’t make sense. Younger students won’t have the learning tools yet and some high school students may lack the maturity to make good decisions. And not every teacher can implement personalized learning in the exact same way every year. In fact, for middle and high school teachers, they may not implement personalized learning in the exact same way in every class. I also think personalized learning is an aspiration for some teachers and they cannot be expected to make that transition overnight. That’s one of the reasons I appreciate Howton’s article and her reflection on her transition to blended and personalized learning. In fact, I think she offers something of a template for teachers interested in trying to implement personalized learning in their classrooms. Teachers should start small, with one lesson. It’s not just teachers who have to learn how to conduct a class using personalized learning. Students will need to be taught to think differently about their learning and trust that it’s okay for them to have choice. No one should expect dramatic changes overnight. It will take time and patience. And it will have to be okay to blow it every now and then, and then learn from the experience and what students can report from their perspectives. After all, it is about the students and their learning and what makes the most sense for them to be successful. Christensen Institute (2018). Squaring Personalization and Digitization in 2018. https://www.christenseninstitute.org/blog/squaring-personalization-digitization-2018/. Guest blogger Elizabeth Anthony.